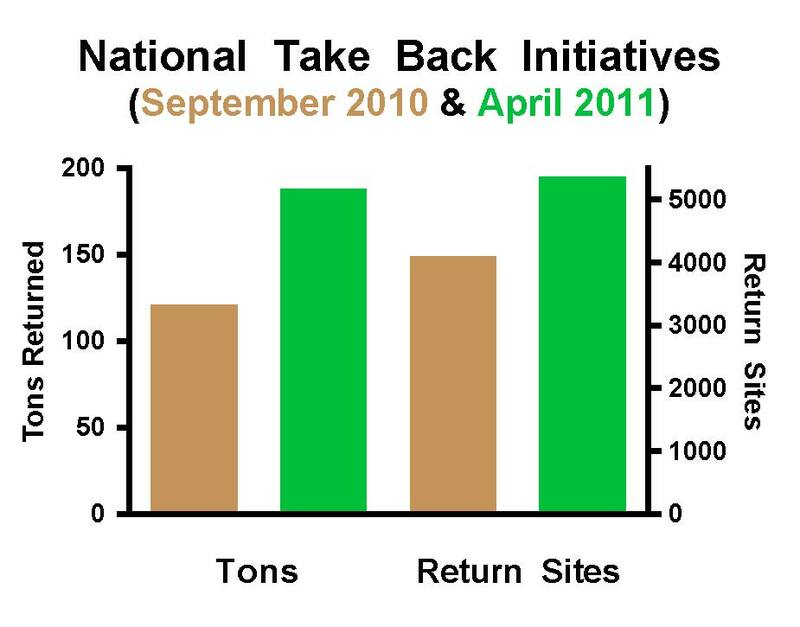 Results are in from the 2nd National Take Back Initiative held on April 30th and they are impressive, with substantially more medications returned to more return locations than in the prior Take-Back event. Over 188 tons of unused medications were returned to over 5,000 return locations across the US. The event was sponsored by a number of state and federal agencies and spearheaded by the Drug Enforcement Administration (DEA), and it follows on the first such event held last September. Take Back events enable people to safely discard unused medications including prescription drugs that could otherwise fall into the wrong hands and be abused. Prescription drug abuse, particularly abuse of drugs with psychoactive properties such as pain medications (e.g., oxycontin) and stimulants, has become a major public health problem in the US. Although no statistics yet are available on the types and proportions of drugs returned during the Take Back Initiatives, a study of spontaneously returned medications to pharmacies and surgeries in England suggests that drugs acting on the brain (including pain medications) make up around 24% of the total of returned drugs. In a California study conducted by the Teleosis Institute from June – December 2007 (“Research Data on Unused Medicine”), a similar proportion of the return total (23%) was of drugs acting on the brain including painkillers, although controlled substances were excluded from collection efforts and amounted to only 2% of the total. Given that the Take Back events encourage people to discard all unused medications, including controlled substances, it will be very interesting to see collection data to help determine the efficacy of these events in reducing the supply of controlled substances available for diversion. A 2008 report by Avalere Health LLC suggests that millions of pounds of unused prescription medications sit in medicine cabinets across the US, so it seems that scaling up Take Back Initiative events and developing additional means for people to discard unused controlled substance medcations could be beneficial in reducing the US prescription medication abuse problem.